Louis Rolwes and Anthony Jones from Priory high school advanced to the finals of the Catholic trivia contest at Covenant Network. Jones was the winner of the competition after answering every question in the finals correctly. How many times did the rooster crow before Peter denied Jesus? Jenny Niehaus from St. Joseph Academy High School reacted after correctly answering “transubstantiation” to a question on the Eucharist. Niehaus and other students were compin the first round of Catholic trivia at Covenant Network. Who was the son of Abraham and Sarah? Those questions certainly did not stump high school students who participated in the first Catholic High School March Match Up, hosted on Covenant Network Catholic Radio in early March. The quiz game drew upon questions on theology, the saints, the Ten Commandments and Scripture, among other areas. 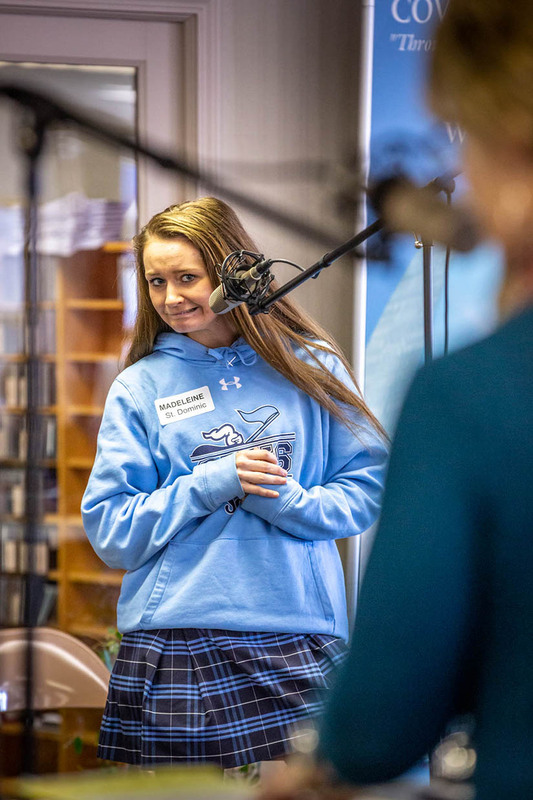 Students from eight Catholic schools — Bishop DuBourg, St. John Vianney, St. Louis Priory, St. Joseph’s Academy, Gibault Catholic in Waterloo, Ill., St. Dominic, John Paul II Preparatory and Cor Jesu Academy — participated in two days of preliminary rounds, which were prerecorded. 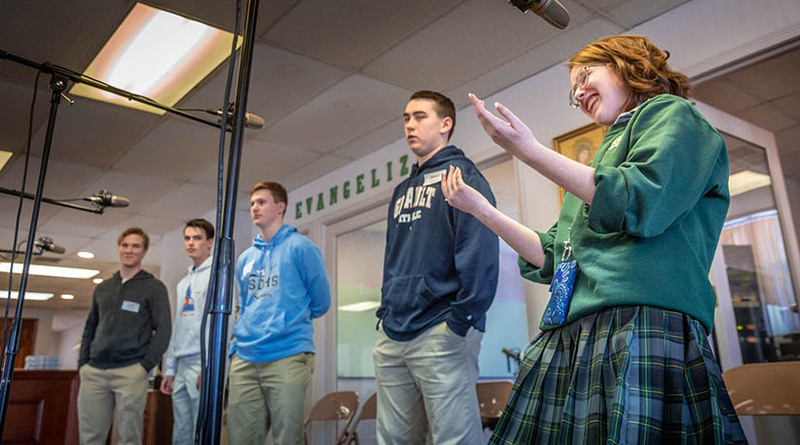 Madeline Stewart from St. Dominic High School waited with anticipation to see if her answer was correct during the first round of Catholic trivia at Covenant Network. Volunteer Felicity Buckley had approached the station about hosting a quiz competition for teens. Covenant Network already has CataQuiz, a Catholic catechesis quiz-style program, hosted by Deacon Jim Sigillito on Thursdays at 3:30 p.m.